At the beginning I always set my alarm (for the first week at least) because I wanted to be sure I had enough walking time to get in my kilometers and make it to a town before the albergue was full. Quick note on albergues if you don't recall from my Camino 101: Pilgrims (with a pilgrim's passport or credencial) can stay in albergues along the way, which cost between 5-10 euros a night. It's basically a hostel for pilgrims, except there aren't sheets and a comforter to sleep in—you just throw your sleeping bag on top. So for the municipal albergues, you can't reserve a spot. You just get there when you get there and hope there's a spot. If it happens to be full, you check others in the town, or perhaps walk to the next town. Normally there's no trouble getting a spot, but when I went last fall I kept hearing that this was the most people to ever walk the Camino (partly thanks to the movie "The Way"), and that places were filling up that never filled up at this time of year. (Peak months were always in the summer, though no idea why because Spain is HOT during those months. So I totally understand why fall is becoming the new summer in terms of busy season on the Camino). The point of this is that yours truly got it in her head that she had to worry about getting a bed (I didn't), and would leave early and usually walk for 6-7 hours, preferring to arrive at her destination around 1pm. Ok end side note. Back to that alarm. For many days I'd get up at 6 and leave by 6:20. Here's what would happen in those 20 minutes. First I quietly (I'm in a room full of sleeping people) get out of my sleeping bag and roll it up right there (usually up on the top bunk). Then I snap on my fanny pack, which will remain on me all day until I take a shower at the next night's hostel. I grab my little blue zippered pouch (contents: toothbrush, toothpaste, retainer case, earplugs), step into my flip flops and walk to the bathroom to brush and pee. Oh and by the way, that blue zippered pouch, clean socks, my glasses and hiker's wool all live inside my baseball cap while I sleep—which sits upside down on the foot of my bed (to hold the items like a bowl). It has everything I'll need in the morning, making the routine slick as ever. I'm already wearing what I'll wear that day—I slept in it—but when I'm back at my bunk from the bathroom I'll throw on any extra layers that I might not have slept in, as it's cold in the morning before the sun comes up. I get my sleeping bag in the backpack, along with almost everything else. I've got packing down to a science and can do this quickly; everything has its place (and there aren't a lot of things!). My zippered mesh packing bags that I treated myself to in Korea were so useful on the Camino. Then depending on the sleeping situation, I either sit down on a chair to put on my shoes in the room, or grab everything and head into some hall or common room with light and a chair. Many places make you take off your shoes when you get there and leave them in a "boots" room, so often I'd go to this area next to put on my shoes. I string some New Zealand hiker's wool through my toes, and then put on my socks, and then shoes. The flip flops then get put in the backpack, as well as the hiker's wool pack. If I haven't done so already, I'll throw a trail bar or two in one of my pockets and/or a banana in my hand. Hat goes on the head, backpack goes on back (oof, yup left shoulder's still sore), and off I go. If I need water, I'll fill up from a fountain on my way out of town. I have a tiny winding-powered flashlight that I'll sometimes use in the dark, but I like paths when I can get by with just the moon light. 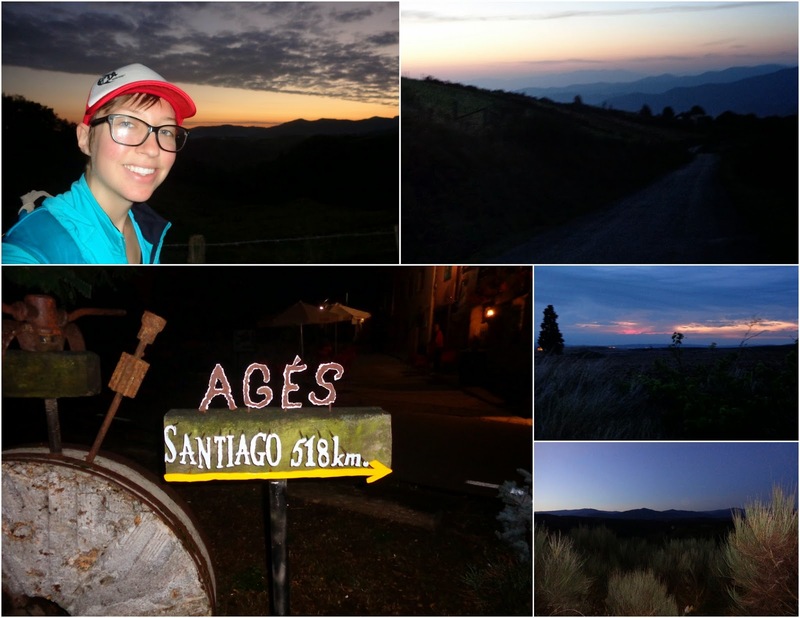 Leaving in the dark meant I got to see plenty of beautiful sunrises throughout the Camino. While walking alone, I would only stop during the next six or seven hours for one of two reasons: (1) bathroom break, or (2) snack/food break. If I just had to pee, and there were an opportune spot (sometimes I'd walk a while until you find one—you can be walking through treeless plains some days), I just squat and let it out, and then I'm back walking again. Various bunches of toilet paper were in my fanny pack for quick/easy access, which were collected any time I was in a real bathroom with TP, plus I carried a roll of TP in my backpack. If I wanted a real bathroom (thanks to my lovely IBS), I'd have to be walking through a town with a bar. After using the restroom I'd usually order the cheapest little thing from behind the bar to carry with me (usually 1/2 bocadillo de atún or tortilla), so I didn't feel like one of those people who just uses a bathroom without giving the place any business. 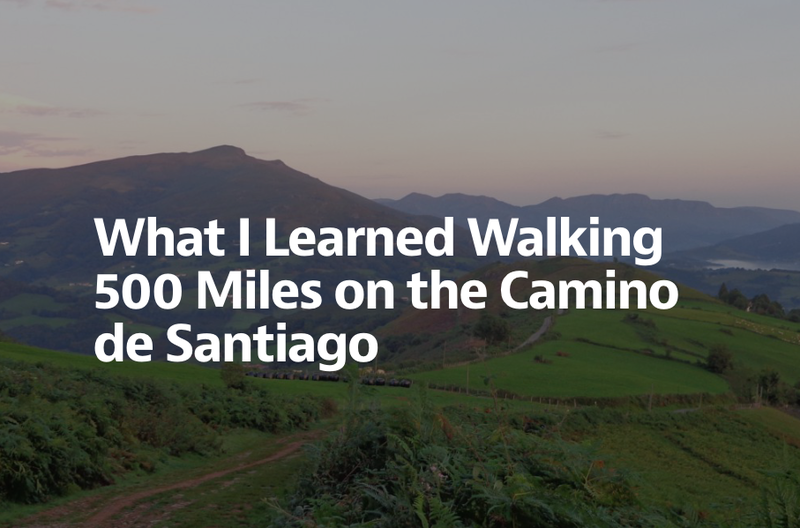 But later on in the Camino, I'd care less about this, and in "bathroom emergencies" would use bar restrooms that were frequented by lots of pilgrims, and then dip out without buying anything. And then for food, if I'd buy something when using the restroom at a bar, I'd carry it with me and eat it while I walked. I just wanted to keep going! Get the walking done so I could relax in the afternoon (which is totally not how you should look at it, but how my mind decided to take it all in). A few times I'd stop to cut open a kiwi with my cool pocket knife, and eat it with the spoon that was also part of said pocket knife. You get your pilgrim's passport stamped and pay up at the start. 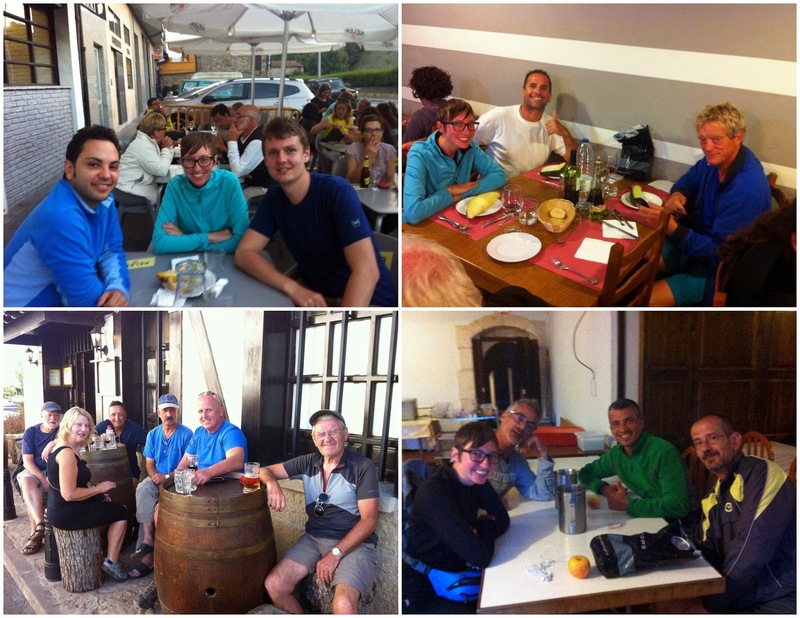 If you're at a municipal albergue, the workers are all volunteers who volunteer on the Camino for a 2-week shift (they pay all expenses to get themselves there, and work for free). At some of the smaller albergues, sometimes they'll just take your real passport and get you settled in; you come back and pay after you've showered. As I mentioned earlier, at many albergues you have to leave your "boots" in a certain room/area, but I'd usually rip them off while waiting in line to check in anyway, because I am hella wearing my flip flops for the rest of the day—always! After paying and claiming your bunk, the very next thing you want to do is quickly shower. I'd grab my travel towel, which lives in a small, handy zippered carrying thing with mesh pouches, plus my other set of clothes that I'd washed the previous day. It was always simple and painless, because there are no choice to make—you just wear the only other set of clothes you have. Why rush to get showered? Because then the clothes you wore that day can be washed. Using a bar of soap, usually borrowed from others (because I'd only packed a tiny container of liquid soap, which spilled all over inside its ziplock bag), next I'd wash my clothes in a sink. Some places prohibit clothes washing in the bathrooms because they have sinks outside just for this. Often places had little plastic tubs to use, so you could wash away from the sink to let other people in. After wringing them out, then you've gotta hang them. And the clothes need to dry significantly before the sun goes down, which is the sole reason for trying to check in earlier in the afternoon and showering quickly, so that clothes have more sunlight hours to dry. 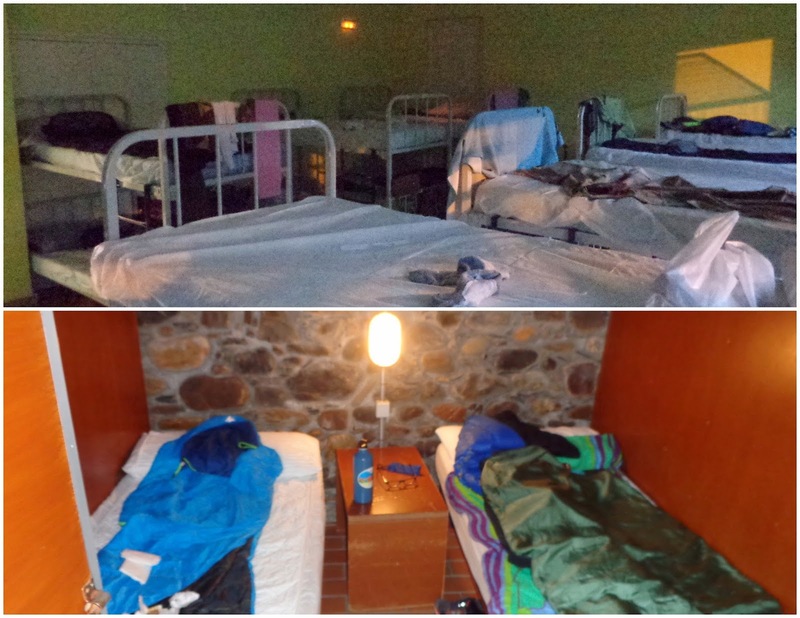 In fact, one day when I got to an albergue the latest I'd ever arrived (between 3 - 4 p.m.), and the owner was nowhere to be found, I went inside, claimed a bunk, showered and began washing my clothes before ever checking in or paying. I don't think I'd normally be so ballsy, but the sunlight hours! It was dwindling away! And your clothes need to dry, because that's what you're wearing tomorrow afternoon. Partway through the Camino I bought clothespins (super cheap), because then you can hang things without folding them in half over the line, which makes them dry quicker. You learn all the drying tricks on the Camino. Depending on what I'd eaten while walking, usually I had a lunch after checking in and showering/washing clothes. Maybe you go to a grocery store and make something, or maybe you go to a restaurant or the local bar. If there were a pilgrim menú del día (menu of the day) that night that I'd decide to eat at, then it would be a small, light lunch of snacking. At some point that afternoon or evening I'd write in my journal, and check my guidebook to see where I wanted to aim for the following day. Sometimes you'd grab a drink at the local pub with some other pilgrims and chat. 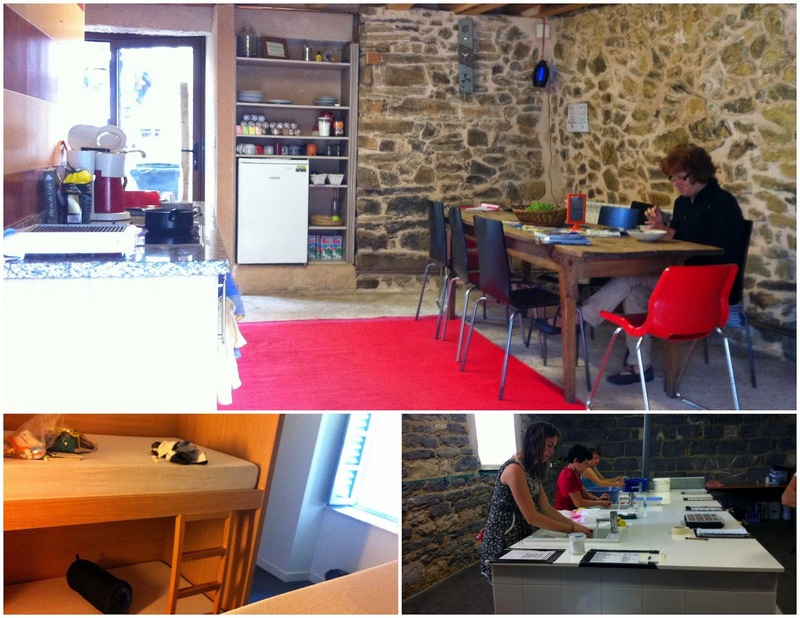 Or hang out at the albergue. Or walk around the town to explore. Or stock up on more energy bars if there's a shop. Buy more fruit. Chat with more pilgrims or the bartender in the tiny town's only bar. One afternoon a Spanish and Italian friend and I jumped into this cold river. I remember that afternoon clearly. 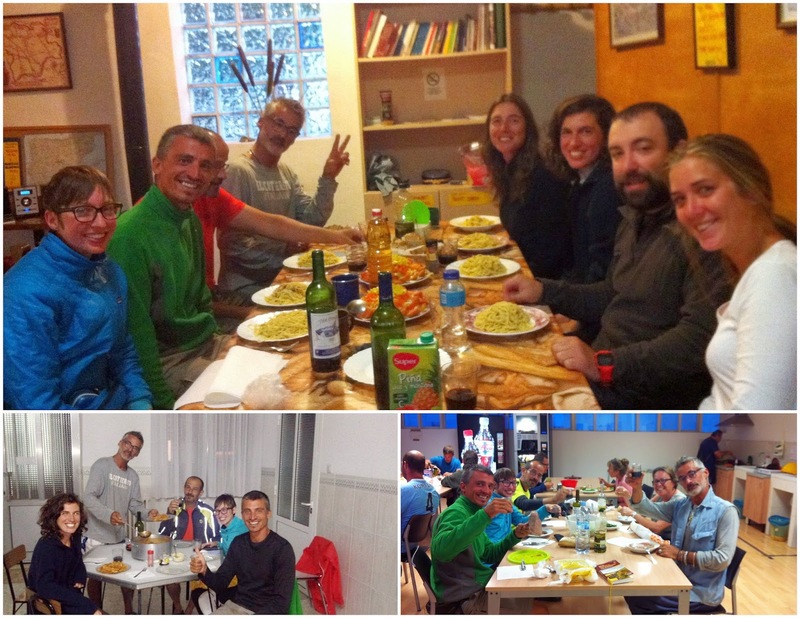 Some evenings I'd cook with other pilgrims in the albergue and have a nice big shared meal. But among your afternoon/evening activities, you're always aware of when your clothes are dry, because then you take them off the line and bring them inside. You pay close attention to the sky, because when rain clouds come near, your stuff had better be off of that line. Curfew at albergues is 10 p.m., but I was usually in bed before then—maybe at 9 p.m. You're healthily exhausted from waking up so early and walking all day, so sleep usually came quickly. 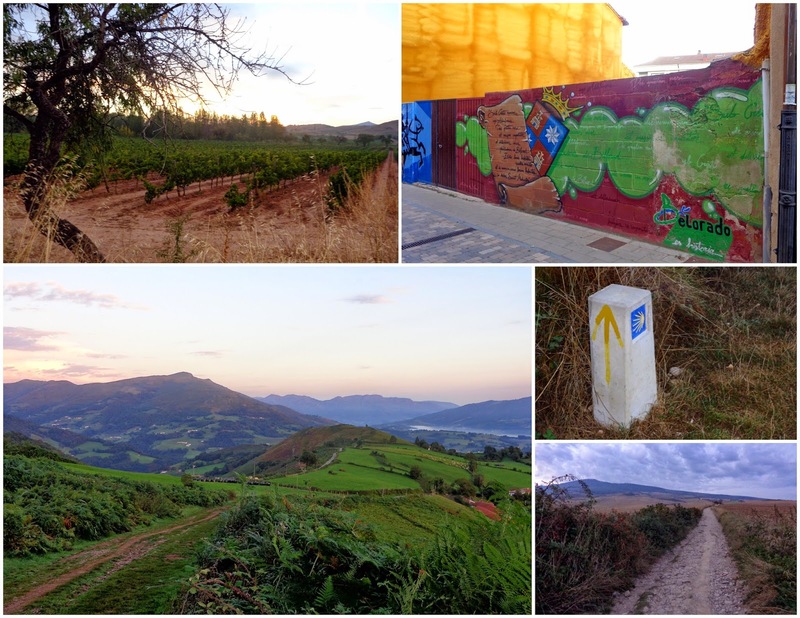 And that, my friends, is what an average day was like on the Camino. Anyone have questions about any particular part? Is it what you expected to hear?